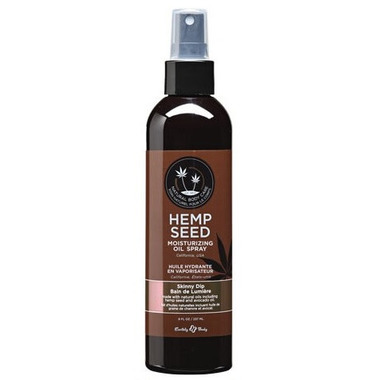 Earthly Body Hemp Seed Moisturizing Oil Spray Skinny Dip is made with natural oils including hemp seed and coconut oil. The blend of natural oils. Fast absorbing this multi-purpose oil spray (almost) replaces lotion! Perfect as an everyday moisturizer, a silky smooth bath additive, or even a lightweight massage oil. Made with Hemp Seed, Coconut, Soy, Apricot, Avocado, and Jojoba Oils plus Vitamin E. Non-greasy, fast absorbing.